Russian authorities rescued a team of 19 ivory hunters this week who were stranded without food for nearly two weeks on an Arctic island in the Laptev Sea that’s home to more wooly mammoth remains than anywhere else on earth. Temperatures had dropped below five degrees Fahrenheit, and the men were reportedly near the brink of death after a search for “white gold” buried in the island’s permafrost went horribly wrong. Problems began for the tusk hunters on October 7 when they sent out an alert saying that a transport boat had broken and they were now unable to leave the island, according to The Siberian Times. Poor weather prevented any rescue efforts for several days until the Rescue Service of Yakutia was finally able to send a helicopter on October 19 (the last men were picked up by October 21). The incident took place on the remote Bolshoy Lyakhovsky Island, the largest of the Lyakhovsky Islands and the southernmost within the greater chain of New Siberian Islands. The helicopter came from the regional capital of Yakutsk, while a team staged the risky operation to save the stranded hunters from the small settlement of Tiksi, located along the Buor-Khaya Gulf of the Laptev Sea. 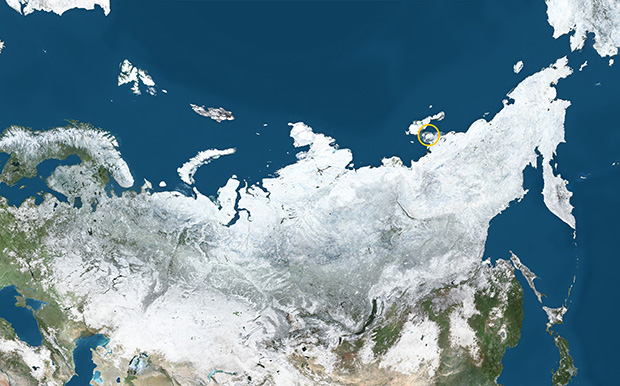 Bolshoy Lyakhovsky Island, circled here, is in remote Eastern Siberia. The Rescue Service of Yakutia said in a statement Tuesday that a search and rescue team followed footprints in the snow to locate the men, some of whom were sheltered in snow-covered tents at the mouth of the Alyy Urekh River. Another group sought shelter in the abandoned polar weather station Kigilyakh, while four more tusk hunters were found on the nearby Stolbovoy Island. The rescue team airlifted all men off the islands over the course of three harrowing days. Many were unable to walk on their own two feet and most were in “critically depleted condition.” The 19 hunters went to hospitals on the Russian mainland, where six are said to be in critical condition, suffering from exposure to the extreme cold. We were strictly limited in time because of fuel economy, and the helicopter could wait for us no more than eight minutes. We landed just a few meters away from the tent and grabbed the people, all of whom were severely depleted. They saw us and started hugging us, they were so happy. One even tried to kiss the rescuers. The Lyakhovsky Islands are named after Ivan Lyakhov, a Russian merchant who first explored the region in the 1770s in search of mammoth ivory. Believed to be one of the last places on earth mammoths survived before the species died out some 10,000 years ago, their remains have been well preserved in the permafrost. The Lyakhovsky Islands made global headlines two years ago when a team of paleontologists discovered a 13,300-year-old spear made from the horn of a woolly rhino, another beast that roamed this area around the same time as the wooly mammoth. The tool was the first from the Paleolithic era found this far north, with previous discoveries located some 235 miles to the south along the Yana River in the Siberian mainland. The discovery of such an ancient tool meant that Paleolithic man penetrated grounds much further north than previously understood. A search for further evidence of early man on this remote island — in addition to the promise of “white gold” in the form of mammoth tusks — has brought hordes of amateur hunters to the Arctic, including the men who were rescued this week. A lucrative business for the hunters, who can fetch up to $30,000 per tusk, this gold rush in mammoth ivory has also increased the number of dramatic rescues in some of Russia’s most remote and challenging regions.